Treasury Secretary Steven Mnuchin has told China not to weaken its currency as the U.S. and China try to resolve their trade differences. Mnuchin told the Financial Times the Treasury Department is closely watching the currency market and wants to talk about the issue with China as part of trade discussions. "As we look at trade issues there is no question that we want to make sure China is not doing competitive devaluations," Mnuchin said. "The renminbi has depreciated significantly during the year. … We are going to absolutely want to make sure that as part of any trade understanding we come to that currency has to be part of that." China's renminbi, also known as the yuan, is down 6.5 percent this year versus the U.S. dollar through Wednesday. 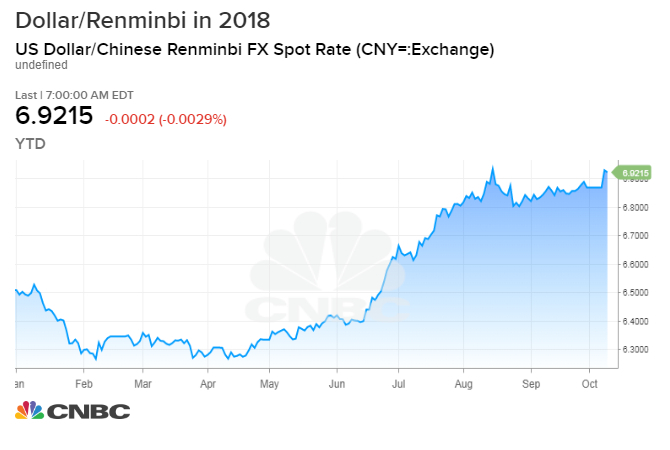 The Chinese currency has fallen this year on concern about slowing growth in the Asian country compared with the strengthening U.S. economy. The White House's latest tariffs of 10 percent on $200 billion of imports from China took effect in late September. President Donald Trump, in a Sept. 17 statement, said the tariffs would rise to 25 percent on Jan. 1. See here for the full Financial Times report.